Ningbo Honber Industry & Trade is a well-experienced, China manufacturer of home safe. We have been viewed as a reputable and reliable producer in the home & office security industry. With continuous innovation and improved technique, we can assure you that the security products we provide are made with high quality. 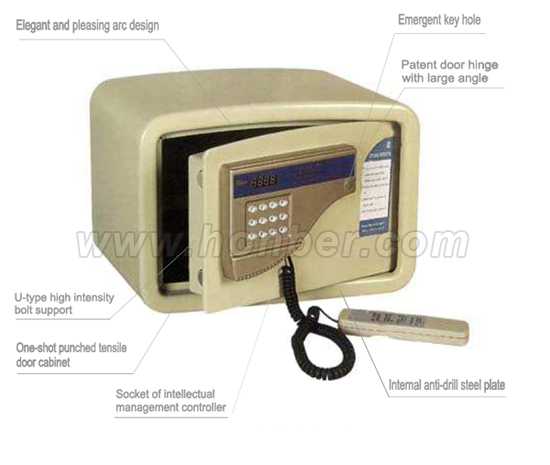 Our Home Safe are designed with some good and advanced specialties including LED Display, three levels of code management for guest code(4-digitt), master code(6-digit) and intellectual management code, override key for emergent opening, automatic motor drive, double locking bolts. Besides, the home safe is equipped with seamless molding case with epoxy powder coating, 3 incorrect entries buzzer and auto-locking function, mounting bolts and floor carpet included, more than 100 degree angle to open door, for piece of 1.5V battery for power supply with low battery precaution, various color for wall safes are available, and OEM orders are accepted. Home Safe are alternative elements for household appliances. But with the products in your house could offer you an extra protection of all your valuables without manpower involved. All you need to do is to find a perfect one, and then keep it in a proper space; you will be able to lock everything up in safety. Needless to say, our products are equipped with everything required. Home safe offer perfect protection of jewelry, money, valuables, passports and important papers. The products are one of deterrents from robbery and provide needed security from fire and climate changes. It should be an easy way to install and conceal your valuables.